This is a sponsored conversation written by me on behalf of Tatu Digital Media. All opinions are 100% my own and may differ from yours. I will only endorse companies, products and services that I believe, based on my own experiences, are worthy of endorsement. It will officially be spring in just three days. The season of renewal, of blooming flowers, and upcoming events and holidays. In April you have Easter, in May there’s Mother’s Day, Teacher Appreciation, and high school and college graduations. Plus there’s always baby showers and birthdays, of course. With so many special occasions on the horizon, I like being prepared. 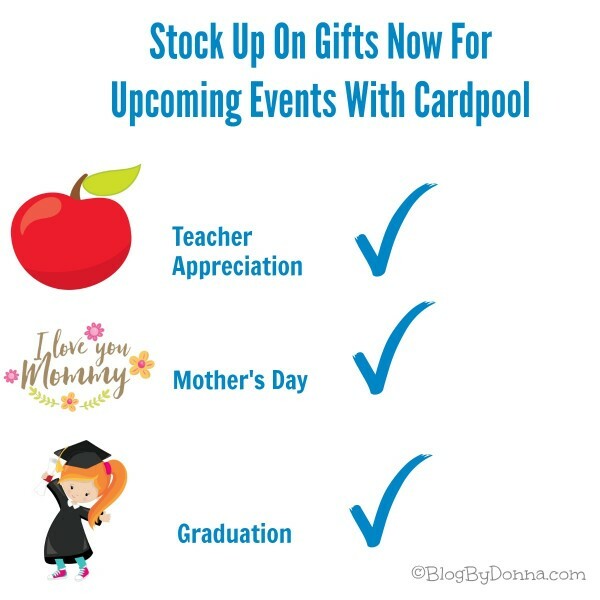 An excellent way to do that is to stock up on gifts with Cardpool. Cardpool is a gift card exchange that makes it easy for anyone to safely and securely buy discounted pre-owned gift cards at up to 35% off or sell unwanted gift cards for up to 92% of their value. Purchases come with a 1-year guarantee! Find out more at Cardpool.com. Starting today, 3/17, thru 3/30 you can save up to 11% on gift cards from these top brands…. Buy before you shop by buying gift cards at a savings and then purchase a gift for an upcoming event. I know the Starbucks, Apple Store, and Barnes & Noble gift cards will come in handy for some graduation gifts for the graduates on my list. I’m also going to stock up on the Starbucks and JCPenney (I’ll be prepared for back to school shopping) gift cards at Cardpool for myself. HURRY! Get gift cards at great savings before this deal ends on 3/30. Now if this isn’t enough great news, Tatu Digital Media is giving away a $100 Amazon gift card! Giveaway ends 3/30. Enter on the Rafflecopter form below. Good luck!